Maya civilization is 3000 years old, it had reached a high intellectual and artistic level, long before the discovery of America by Europeans. 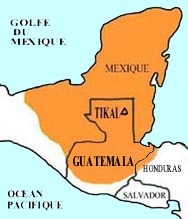 Its location area (orange-coloured zone on the map) is the Yucatan peninsula, a hot and wet zone covered with forests and where epiphytes, among which epiphyitic cacti, abundantly grow. The genuine thorough excavations only date back to the end of the 19th century and the beginning of the 20th century. It is what partially explains why many Maya sites such as Tikal, which is the largest one, are still covered with the tropical forest, making it possible to contemplate splendid landscapes, with plenty of epiphytes (Lichens, Bromeliads, among which Tillandsias, Cacti, etc. ), all these plants growing near the pyramid temples, impressive both for their size and the delicacy of their sculptures. The highest Tikal temple is 70 meters high ; it's slightly higher than the canopea. But the following photographs will be more explicit to you than my words. BACK TO THE GUATEMALAN EPIPHYTIC CACTI PHOTO GALLERY.